The all-new, fourth-generation Kia Rio will make its world premiere on 29 September in Paris, at the 2016 Mondial de l’Automobile. With a progressive new exterior and interior design, the Rio is revealed for the first time globally today through an exclusive set of images. Design of the new Rio was led by Kia’s design centres in Germany and California, in close collaboration with the company’s global design headquarters in Namyang, Korea. The appearance of the new Rio is defined by straight lines and smooth surfacing, giving the car a distinctive, confident new look. At the front, the Rio wears the latest evolution of Kia’s ‘tiger-nose’ grille, now thinner in height and wider across the front of the car. Integrated bi-function projection headlamps – again, thinner and more sculpted than those of its predecessor – project a new U-shaped LED light signature. Changes to the front of the car, including moving the fog lamps’ position outwards within the front bumper, are designed to add greater visual width for a more stable overall look. The new Rio grows by 5mm in width (to 1,725mm), further adding to this effect. In profile, the fourth-generation Rio’s lengthened, more balanced stance is achieved with a long bonnet and longer front overhang, a 10 mm longer wheelbase (up to 2,580 mm), a thinner, more upright C-pillar, and a shorter rear overhang. Overall, the new car is 15mm longer than its predecessor (now 4,065mm long), and 5mm lower in height (to 1,450mm). Straight, clearly-defined lines run down the full length of the car’s shoulder and along its doors, further stretching the appearance of the car for a more stable, confident look. The rear section of the Rio is now more upright, with a near-vertical rear windscreen and a shorter overhang. The straight line that runs from the grille, through the headlamps and along the top of the doors, continues around the back of the car, paired with thinner, more sculpted rear lamps, which now feature a new arrow-shaped LED light signature. Like the wider-looking ‘face’ of the car, the rear design of the new Rio gives it a stronger overall appearance. 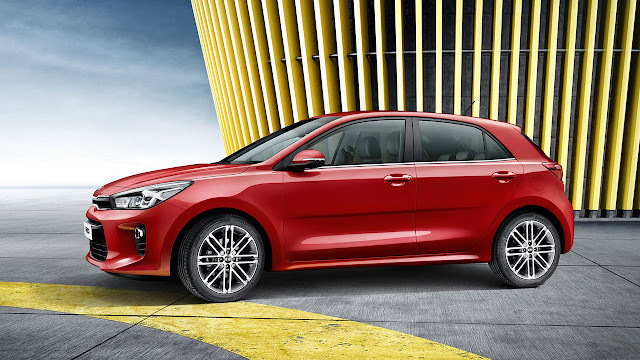 The new Kia Rio will offer motorists a modern new cabin design, featuring sculptural forms and a more ergonomic layout than its predecessor. Like the exterior, straight lines running the width of the dashboard characterise the shape of the interior, giving the cabin a wider appearance and increasing the sense of space for occupants. The dashboard itself is now angled towards the driver, and at its center is a new infotainment system, a ‘floating’ HMI (human-machine interface), with a high-resolution touchscreen to power the Rio’s audio, navigation and new connectivity systems. The new HMI has allowed Kia to reduce the number of buttons on the center console. The new Rio is available with a choice of black or grey cloth seat upholstery, or with black or grey faux leather. A ‘Red Pack’ for the Rio gives buyers black with red faux leather-trimmed seats throughout the cabin. The cabin itself features gloss black and metallic trim throughout, for a more modern finish. 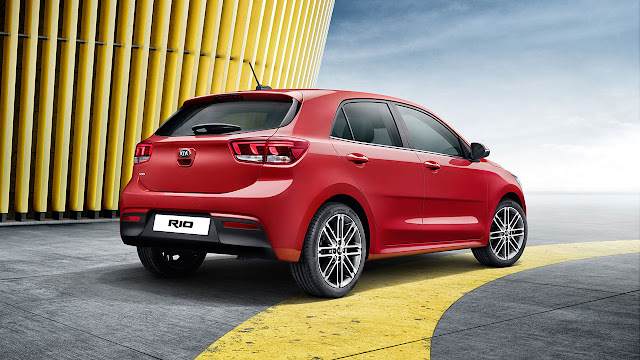 The all-new Rio will offer buyers class-leading practicality and safety technology, the latest connectivity features, and more assured and engaging ride and handling characteristics. 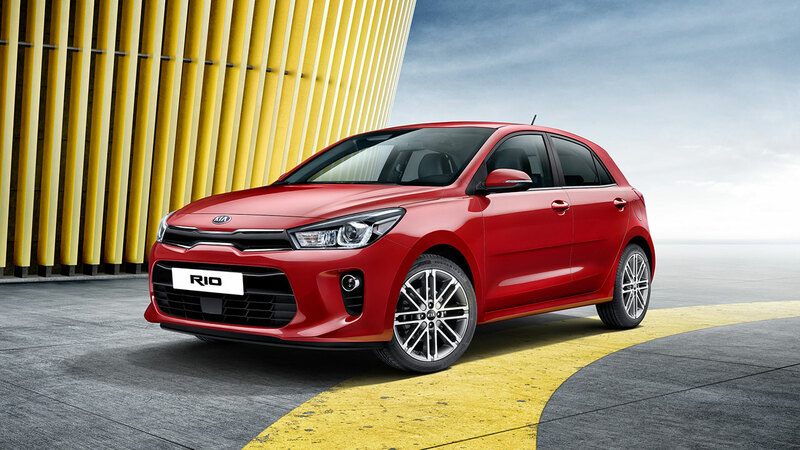 The Kia Rio is the Korean manufacturer’s best-selling model globally, with more than 473,000 sold around the world in 2015. The next generation will enter production towards the end of 2016 for the UK, with production timings for other regions to be announced closer to launch. Kia’s 2016 Mondial de l’Automobile press conference will start at 14:45 CET on 29 September. Kia’s stand will be located in Hall 3of the Paris Expo Porte de Versailles.